Saint Mary’s Bay was part of the territory of the nomadic First Nations people – the Mi’kmaqs, who have lived in eastern North America for at least 3,000 years. They called the bay We’kwayik, meaning ‘running out to an end’. 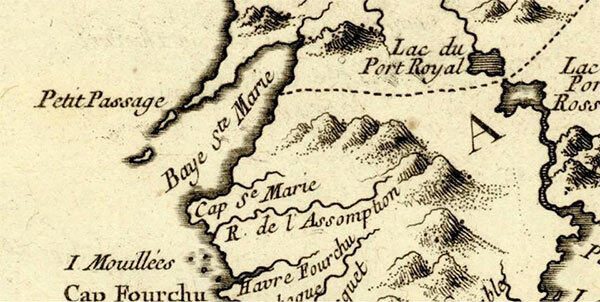 The bay is part of the outer zone of the Bay of Fundy and is about 590 square kilometers (227 square miles) in size. It is a narrow inlet of water approximately 60 kilometers (48 miles) long and only about 15 kilometers (10 miles) wide. Baie Sainte-Marie has moderately high tides: the vertical tidal range is generally about 4.6 meters (15 feet) but in some places it can be as much as 6.4 meters (21 feet). Other parts of the Bay of Fundy have a much greater tidal range, as much as 14 meters (45 feet) – the height of a four-story building. When the tide goes out, long stretches of the ocean bottom are exposed. The nearshore waters of Baie Sainte-Marie are a bustling habitat, home to a variety of waterbirds, including gulls, sea ducks (e.g., eiders, scoters, long-tailed ducks), plovers, sandpipers, grebes, cormorants, and loons at different times of the year. 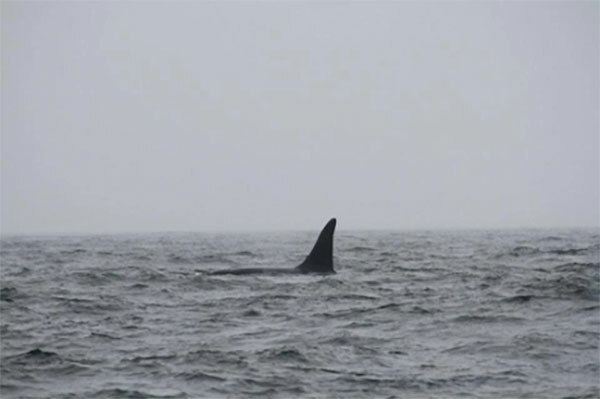 The Bay of Fundy is also the feeding ground for over a dozen species of baleen and toothed whales, including Humpbacks and Minkes. Winter and spring are the times of year to look for Red-breasted Mergansers on the water. 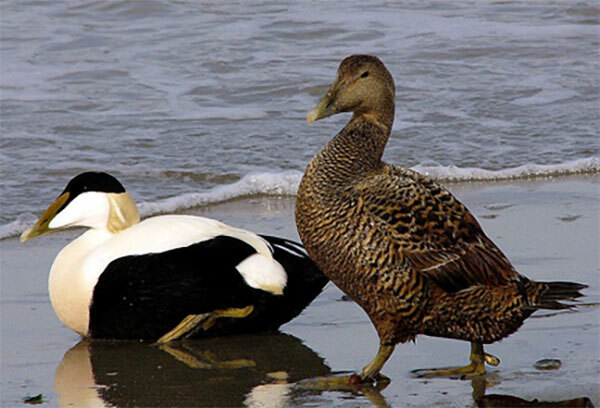 They are among the showiest of the sea ducks: with a very distinctive spikey crest on the back of their heads. The male has a shiny dark green head, broad white ring around its neck and a chestnut band across the breast. The female has a chestnut-coloured head with crests. In August and September, plovers are common along the shore. 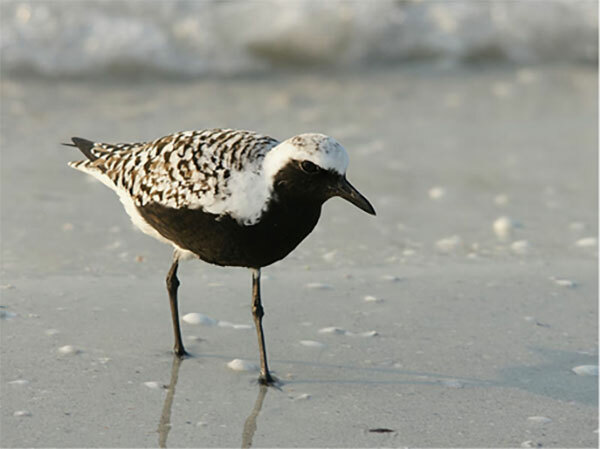 A plover is a wading bird with a body shaped like a pigeon, and a head with large eyes. They dart around on the sand flats, zigzagging as they go. 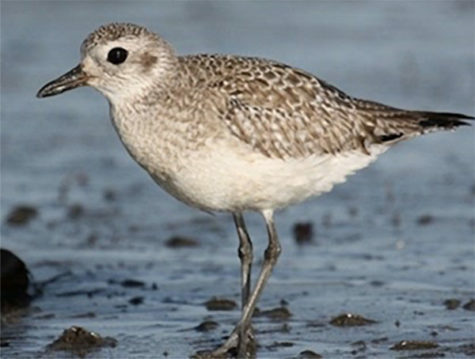 One of the more common plovers along these shores during late summer is the Black-bellied Plover, with its white head and patterned wings and back over a black underbody. They are usually around 26-34 cm in size (10 ½” to 13 ½”). The Semipalmated Plover is smaller, around 6 ½” – 7 ½” in height, with brown backs, white undersides, a black arc on its lower neck and bright orange beak and legs. Bird biologists say that there is no such thing as a ‘sea gull’. There are in fact many different kinds of gulls. Along the shores of Baie Sainte-Marie, we see the Great Black-backed Gull, the grey Herring Gull and sometimes the Ring-billed Gull. These waterbirds prefer foods rich in fatty fish oils. It’s common to see flocks of gulls chasing fishing boats on the bay. 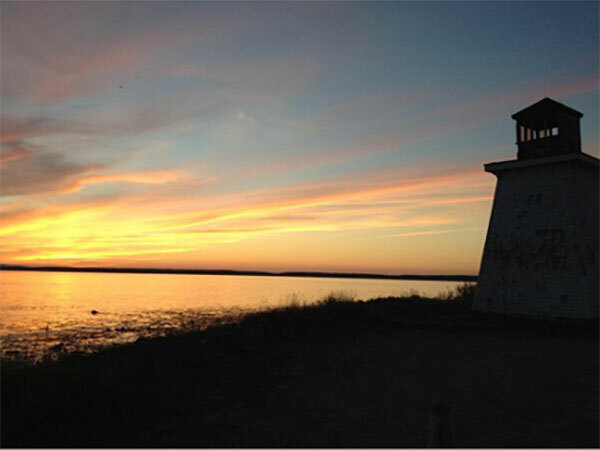 Those who live or spend time along the shores of Baie Sainte-Marie often fall in love with the play of light, the brilliant sunsets and the slow transit of boat traffic on the water. The bay also contributes to the economy of the region, with commercial fisheries for lobster, scallops, clams, herring, haddock and a variety of ground fish species. The seafood processing plants along the bay produce smoked, pickled, dried and frozen fish, fish pâtés, fish pastes and roe.